Out with the old, in with the new. With Pollard's Fading Captain Series record label in the grave, and his Prom is Coming label MIA, this EP marked the first release on the new Guided by Voices Inc. This 12'' EP contained 3 tracks, and is often cataloged as and EP rather than a single. Terms are terms, but this is basically a damn single. The A-side is the single off the Robert Pollard is Off the Business LP. The whole shebang is worth the buck here, as the two b-sides exclusives are pretty solid too. Limited to 1000 cd singles, and 500 12"s. GBV-1! 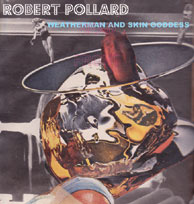 Weatherman And Skingoddess- Read review here. Same version as on Robert Pollard Is Off To Business. Coat Factory Zero- 4 tick-tock rhythmic pulse starts it off. GBV style overdub vocal delivery. What is this? A lost Under the Bushes Under the Stars outtake? Chorus is a a bit weak and muddled in contrast to the verse build-up. Almost a hidden classic, but this gem still has some undeniable sheen to it. A ridiculously solid single collection. Kiss the Quiet Man is as good as Todd era solo gets.